Courtesy of the recently declassified Fed discount window documents, we now know that the biggest beneficiaries of the Fed's generosity during the peak of the credit crisis were foreign banks, among which Belgium's Dexia was the most troubled, and thus most lent to, bank. Having been thus exposed, many speculated that going forward the US central bank would primarily focus its "rescue" efforts on US banks, not US-based (or local branches) of foreign (read European) banks: after all that's what the ECB is for, while the Fed's role is to stimulate US employment and to keep US inflation modest. And furthermore, should the ECB need to bail out its banks, it could simply do what the Fed does, and monetize debt, thus boosting its assets, while concurrently expanding its excess reserves thus generating fungible capital which would go to European banks. Wrong. Below we present that not only has the Fed's bailout of foreign banks not terminated with the drop in discount window borrowings or the unwind of the Primary Dealer Credit Facility, but that the only beneficiary of the reserves generated were US-based branches of foreign banks (which in turn turned around and funnelled the cash back to their domestic branches), a shocking finding which explains not only why US banks have been unwilling and, far more importantly, unable to lend out these reserves, but that anyone retaining hopes that with the end of QE2 the reserves that hypothetically had been accumulated at US banks would be flipped to purchase Treasurys, has been dead wrong, therefore making the case for QE3 a done deal. In summary, instead of doing everything in its power to stimulate reserve, and thus cash, accumulation at domestic (US) banks which would in turn encourage lending to US borrowers, the Fed has been conducting yet another stealthy foreign bank rescue operation, which rerouted $600 billion in capital from potential borrowers to insolvent foreign financial institutions in the past 7 months. QE2 was nothing more (or less) than another European bank rescue operation! For those who can't wait for the punchline, here it is. Below we chart the total cash holdings of Foreign-related banks in the US using weekly H.8 data. 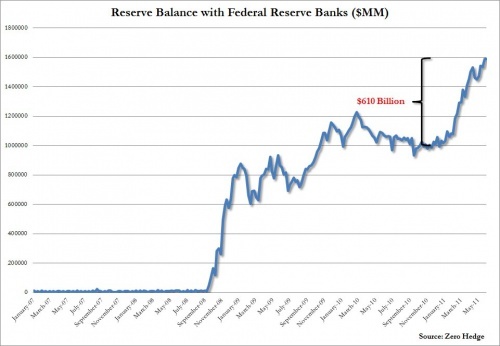 Note the $630 billion increase in foreign bank cash balances since November 3, which just so happens is the date when the Fed commenced QE2 operations in the form of adding excess reserves to the liability side of its balance sheet. Here is the change in Fed reserves during QE2 (from the Fed's H.4.1 statement, ending with the week of June 1). Above, note that Fed reserves increased by $610 billion for the duration of QE2 through the week ending June 1 (and by another $70 billion in the week ending June 8, although since we only have bank cash data through June 1, we use the former number, although we are certain that the bulk of this incremental cash once again went to foreign financial institutions). 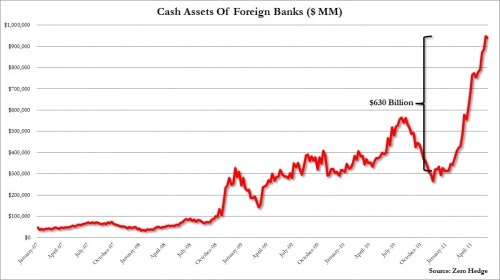 So how did cash held by US banks fare during QE2? Well, not good. 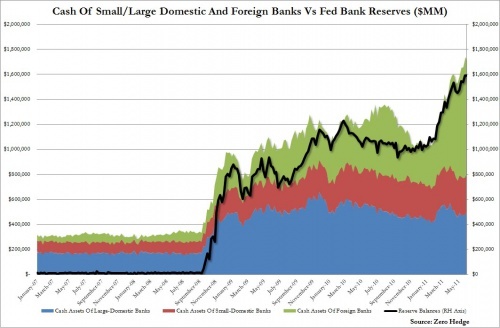 The chart below demonstrates cash balances at small and large US domestic banks, as well as the cash at foreign banks, all of which is compared to total Fed reserves plotted on the same axis. It pretty much explains it all.